The narrative began during a playoff game in January where the New England Patriots were en route to a definitive 45-7 defeat of the Indianapolis Colts. Someone noticed that the footballs the Patriots were using seemed to be softer (less-inflated, that is) than they should have been, and within minutes, the NFL’s security gumshoes were on the case. That conclusion apparently flows from the actions and words in text messages of two members of the Patriots staff who were responsible for the team’s footballs before games and a certain lack of cooperation on Brady’s part in his dealings with Wells. The inference that Wells drew was that the employees conspired to take more air out of the balls that Brady used than was legal under NFL regulations and that the quarterback was actively or passively complicit in the foul deed. The announcement of sanctions followed from the commissioner’s office in New York: Brady suspended for four games (at a cost to him of close to $2 million), a $1 million fine for the Patriots, and the loss of some draft picks over the next few years. After an initial outcry against the findings and the penalties, Patriots owner Robert Kraft said he would not contest the commissioner’s decision. But his quarterback appealed the verdict against him. Goodell, prosecutor, judge, and juror, presided over the daylong appeal hearing late last month and then went away to think things over. Over the last many months, the attention given to this discrepancy between the amount of air in the footballs used by the Patriots and by the Colts in that game in January has been mind-numbing. We have been lectured to about the Ideal Gas Law and its possible ramifications with respect to the air in footballs on a warm, wet, and windy winter afternoon in New England in January; we have read and watched and listened as people hired to write, report, and talk omnisciently about sports weighed in with their opinions on who did what and when and why cheating on this micro-scale is unacceptable for the good of all that is right and just. What we haven’t heard, at least since the days after the story broke, is anything of substance from Brady, a man who formerly carried a sterling reputation as a true-blood Hall of Fame-caliber player and as a gentleman off the field. That public profile has been tarnished irreparably. At a press conference in January, the quarterback, after noting his preference was for the lowest inflation allowed for his footballs, said, “I didn’t alter the ball in any way. I would never do anything outside of the rules of play.” He added, “Everyone’s trying to figure out what happened. I was as surprised as anyone at what happened.” The only additional comment that Brady has made to the general public about the controversy came last spring when he told a gathering at Salem State University that he hadn’t read the Wells report but that he would have something to say when he did read it. There’s nothing on the public record of him saying anything after that. This is the tightest spot Tom Brady has ever been in. So far as we know today, he continues to maintain his innocence in the so-called Deflategate case. Officials of the league he has played in for 15 years as a first-rate contributor to the welfare of his team and his league don’t believe him. They have called him out as a liar and a cheat, a judgment that has been widely endorsed outside the realm where Patriots fans live. 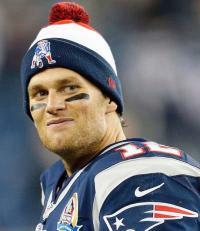 Sportwriters, columnists and sports media savants seem to have come to a consensus conclusion that the commissioner will reduce the sentence, Brady will cop to a sort-of misdemeanor offense, and everyone will get ready for the games in the fall. That’s all about football. But what about honor? If Tom Brady is innocent of any wrongdoing in this matter, as he has said he is, how can he accept any ruling against him and just go back to playing games? Such a concession will mark the end of what has essentially been a fairy-tale public life and leave him self-branded as an outlaw. Tom Brady has a beautiful family, wealth, a fistful of Super Bowl rings, and the admiration of legions of fans and just plain folk who have watched him play and live to the highest expectations for a generation of football time. If in the end Roger Goodell is unwilling to concede the innocence that Brady maintains, isn’t retirement the only honorable way for the estimable quarterback to go?